Rivers and streams are created by precipitation, melting ice or springs. These moving bodies of water flow through channels in which the bottom is known as the bed and the sides as the banks. Rivers can be wide and deep, and many empty into larger bodies of waters such as oceans or lakes. Streams are smaller and can converge to create rivers. 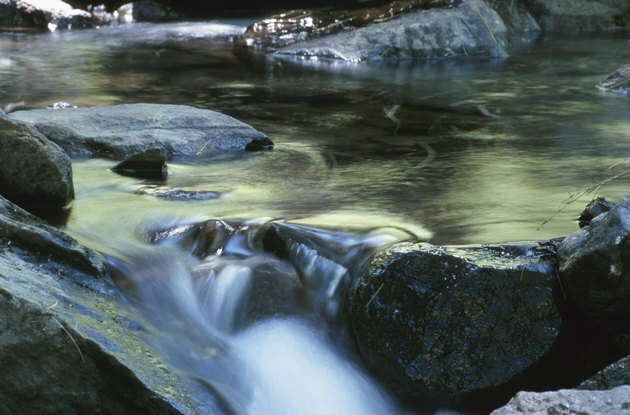 Rivers and streams are fresh water and hold up to 3 percent of the Earth's fresh water. Freshwater plants include algae, bulrushes and cattails, and freshwater animals include crayfish, fish and eels. Three types of plants usually live in rivers and streams: algae, mosses and submerged plants. Calmer rivers or streams may have emergent plants, or plants that are grounded to the waterway's bed, but their stems, flowers and reach extend above the water line. 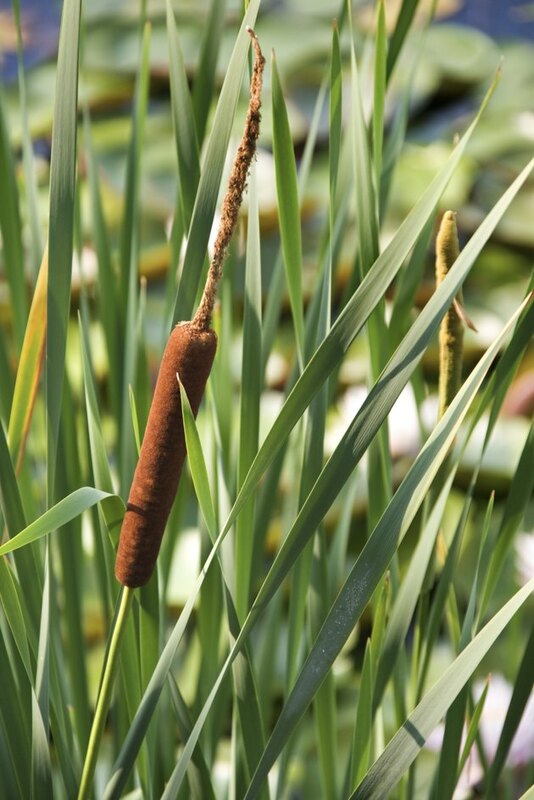 Emergent plants include cattails, flowering rush and bulrushes. Algae are free-floating plants without any true stems, leaves or roots. Stonewort, plankton algae and chara can be found in many rivers and streams. Mosses grow in clumps and have only simple leaves. Mosses usually are found growing on rocks within the bodies of water. Submerged plants grow completely beneath the water, attaching to the bed of the river or stream. These plants can be found in nearly any section of the river, and they can grow in clumps or individually. Examples of submerged plants include pondweeds, coontails, wild celery and waterweed. Animals that do not possess a backbone are known as invertebrates. These include all types of crustaceans, worms, snails and insects. 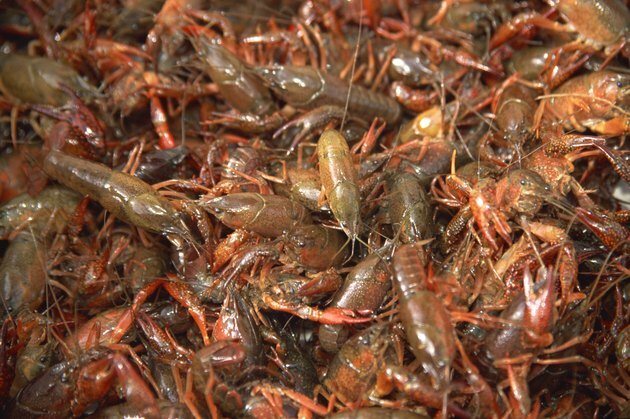 Crustaceans such as crayfish, shrimp, some types of lobster and certain crab species live in streams and rivers. Insect larvae, including the mayfly, caddisfly and stonefly, gestate in streams. Beetles can be found in streams that are extremely clean and have plenty of rocks for the insects to stand on. 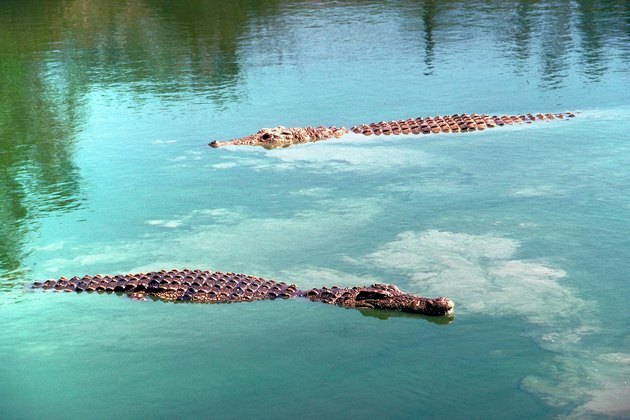 Alligators and crocodiles often call rivers and streams home with crocodiles tending to stay toward the mouth of the river, which is more brackish. African hippopotamuses create their homes in fresh water, spending most of their time soaking in the shallow sections of the rivers. Platypuses also make their home in or around streams and rivers. Frogs and turtles are prevalent in freshwater bodies of all types. Species vary depending on location. Many species of fish can be found in rivers and streams, including trout, eels, mullets, bully's, molly's and catfish.